The name "Andrew" has a lot of meaning in my family. My wife's brother Andrew was a Marine who was killed at Iwo Jima. My dad's father was Andrew. I have cousins named Andrew, and we recently welcomed our third great-grandchild: Andrew. So it should be no surprise that during my November 15 “Writer’s Block” broadcast on Lorraine Ranalli’s Cucina Chatter show, I mentioned that I was new at this “Andy Rooney thing.” Ironically, Andy Rooney passed away at age 92 just before that broadcast aired, and fittingly, I have an Andy Rooney story that’s close to my heart. Like Andy Rooney, my dad would have also been 92 at this time, but he died several years ago in 1996. And, like Andy, he also served in World War Two. Now here’s where the story gets a little more coincidental. My father and mother married in 1943 while he was in the Army, still stationed stateside. By the time he got his orders to ship overseas, she was carrying his child—a child who was destined to become a hack writer making weekly commentary on Cucina Chatter. His name is not important. No, wait a minute, his name is very important, because that’s the crux of this story. You see before my dad left for the European Theater of War, he left instructions with his brother to remind my mother that if the child was a boy, he was to be named Paul. If it were a girl, well…that would be my mother’s call. Many months later, while trudging across Normandy with the Ninth Infantry Division, his ammunition bearer (he was a machine-gunner) handed him a copy of the Stars and Stripes, the newspaper that kept the boys in combat informed of what was going on around them, and what was going on at home. “You made the paper,” he told my father. As my dad looked at the article, he felt the blood drain from his arms. Whenever he told me this story, he always explained how angry it made him at the time. 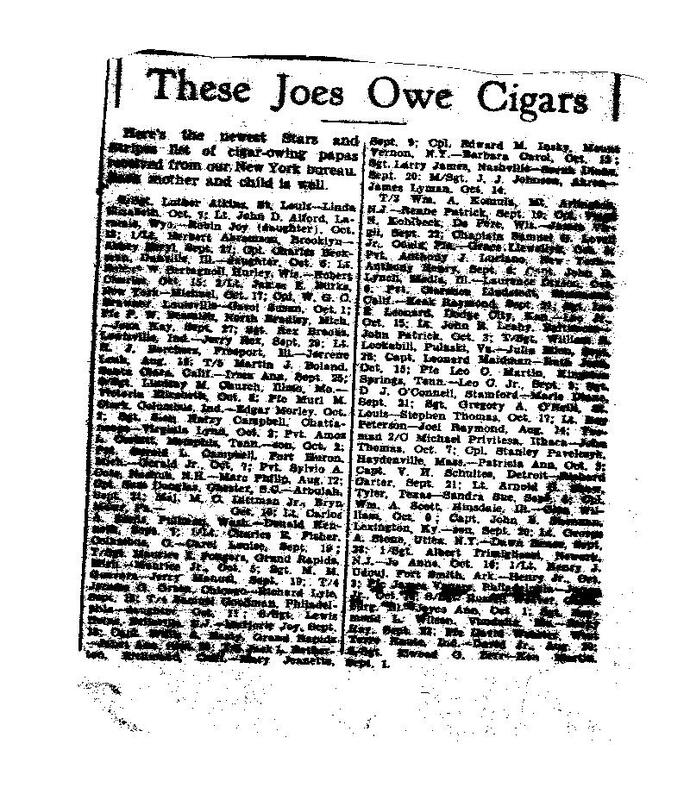 You see, it was a simple little piece, headlined, “These Joes Owe Cigars.” It was a list of all “G.I. Joes” who had recently had children born to their wives back home—and there, in alphabetical order near the bottom of the list, was his name: PFC James Vanore from Philadelphia, and right next to it, the name of his son: James Vanore Jr. along with my birth date. My mother, thinking it very possible that she might never see her young husband again, went against his wishes (and whatever prompting his brother provided) and named his son after him. So today, that hack writer is Jim Vanore, not Paul Vanore (although I do have a cousin Paul in Kennett Square, who does some writing). My dad tore that section out of the Stars and Stripes, and I have it in front of me now, a little yellowed by age, but covered in plastic so it should at least outlive me. But for all the times I’ve held that piece of newsprint in my hands and looked at both our names and wondered how it must have felt to know that you had a son that you may never meet, I never bothered to turn the paper over—until about 10 years ago. That’s when I noticed a bylined article about the fierce battle raging near the Siegfried Line as the U.S. army attempted to cross the Rhine. 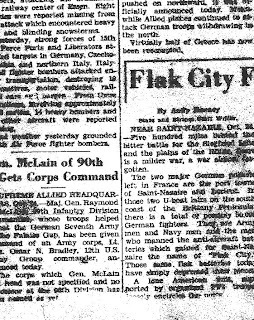 The article was simply headlined, “Flak City,” and it was written by a Stars and Stripes staff writer named Andy Rooney. Ever since I discovered the other side of that paper, I’ve always felt that Andy Rooney, my dad, and I, have had this small ‘tether’ between us. I know it’s a bit of a stretch, but now, every time I hear someone say, “What’s in a name,” I think of the two Jims and the two Andys. Two Andys? Oh, I forget to mention—my father’s brother—the one that was to remind my mother that the boy was to be named Paul—he too shipped out before I was born. You see, my Uncle Andy was an Army medic, and he was named after his father. Uncle Andy was a terrific guy who died when I was in high school. I don’t know if he ever saw the other side of that paper either. 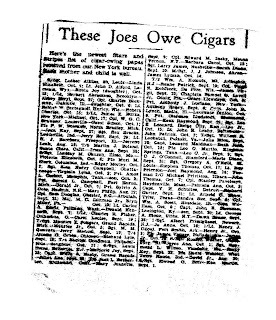 Below are the photo scans of that remnant from the 1944 Stars and Stripes. 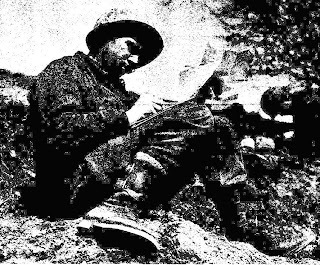 The second photo is (I believe) of my dad underlining that article while in the field in France, since he looks a little peeved. The third has our names at the bottom of the second column. My father underlined them, so the ink bleeds through on the scan. It reads: Pfc James Vanore, Philadelphia—James Jr., Oct 16. 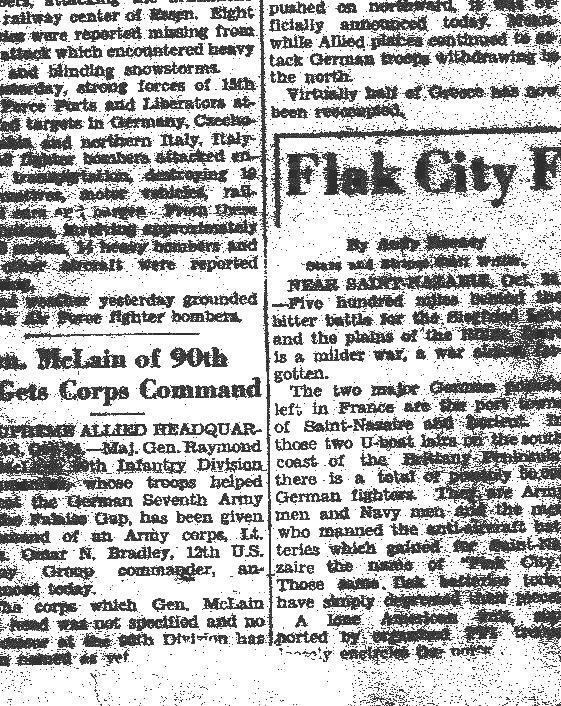 The first is the flip side of the Stars and Stripes, and has a second column article headlined “Flak City,” and the byline underneath that headline reads: By Andy Rooney, Stars and Stripes Staff Writer.